You can add tracking details to expenses and individual expense items. Tracking groups and options can be imported from, and synced with, your accounting platform (QuickBooks or Xero), or you can create separate tracking groups and options in Expend. When you complete an expense, your tracking groups are available on each expense item (under Tracking). Each group contains options, and you can select an option to assign it to your expense item. Only QuickBooks Plus users will have access to classes and tracking. On your Expend dashboard, click Tracking in the menu on the left. A Client group is present by default. If you have connected your accounting platform to Expend, you can import your Customers into the Clients group. Alternatively, you can manage a list of clients in Expend. QuickBooks users: If you have Projects associated with Customers, these will also be imported into the Clients group. In the drop-down list, choose the source of your list of clients – either your accounting platform (QuickBooks or Xero) or Expend. You can change the source of the options in the Clients group, if required, by following the same steps. Under Client, click + Tracking Option. The new client will now be available as a tracking option on expenses and can be assigned to expense items. You can import tracking groups and their options from your accounting platform, or create groups and options in Expend. Imported groups are synced, so that when you make changes on your accounting platform, these changes will be reflected in Expend when the systems are synchronised. Please note that changes aren’t synced immediately. QuickBooks: You can import Classes from QuickBooks. All classes and their sub-classes will be imported as a single tracking group into Expend. Xero: You can import Tracking Categories and their options from Xero. A tracking category in Xero corresponds to a tracking croup in Expend. On the Tracking page, click + Tracking Group in the upper right corner. In the drop-down list, select your accounting platform. Select the group to import. To add or change any of the options in an imported group, please visit your accounting platform and make the necessary changes there. Expend will retrieve changes when the systems are synchronised. If you create a tracking group in Expend, you can manage everything on the Expend dashboard, and changes will be available immediately to users. You can also import a list of options from a CSV file. 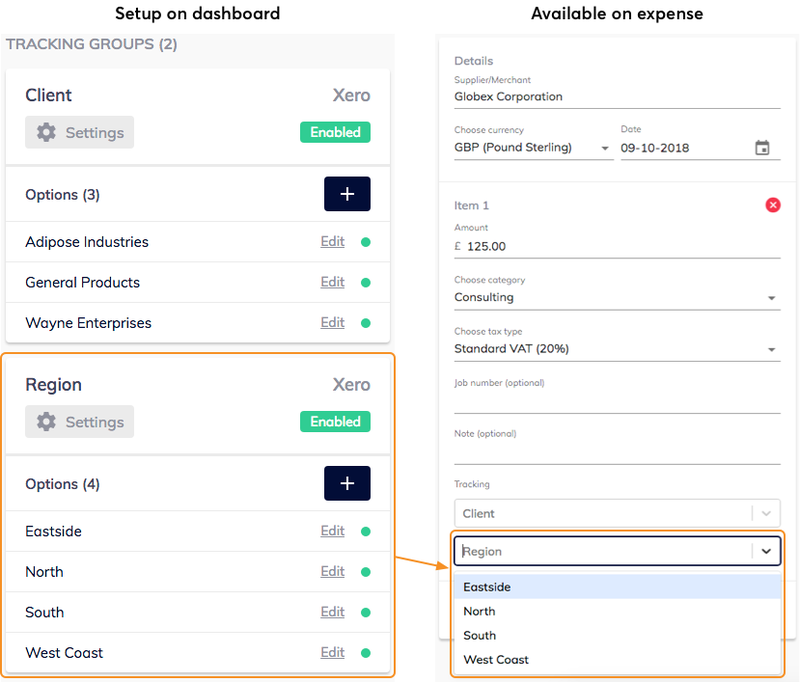 While the options can be assigned to expenses, they aren’t currently synced to accounting platforms that are connected. In the drop-down list, select Create in Expend. The group will now be visible on the Tracking page. Find the group on the Tracking page and click + Tracking Option. Enter the option name. This is the value that users will be able to assign to an expense item. The group will now be available in the tracking group to which it belongs. The first line is a header line and won't be imported. Each line contains the tracking option and a status (true/false or yes/no). The status is optional; you can leave it out and have just the tracking option. It sets the status of an existing tracking option: true or yes will enable the option (or, if it doesn't exist yet, it will be added); false or no will disable the option if it already exists (but if it doesn't, it won't be imported). Optional: Click + Tracking Group, select Create in Expend, enter a name, and click + Create. Go to the tracking group and click Import Options. Click inside the Click to Upload CSV box and select the file to import. Check the preview and, if it looks correct, click Confirm Import. For Expend groups only, you can rename the group and individual options. To rename a group, click the Settings button below its name. You can change the name on the form that opens. Click Update to apply the changes. To rename an option, click Edit next to the option name. You can change the name on the form that opens. Click Update to apply the changes. For imported groups, changes need to be made on the accounting platform. These changes will be synced to Expend when the systems are synchronised. To temporarily prevent users from being able to select any options in a group, you can disable it. On the tracking page, find the group you want to make unavailable. Click the Settings button below the group name. Users will no longer be able to select any options from the group. The option will no longer be available to users. If an option from the group was assigned to an expense item previously, it will remain assigned. To make all the options in a group available again, click Settings and then click Enable. For Expend groups only, you can make individual options unavailable to users, while other options in the same group remain available. Click Edit next to the option name. The option will no longer be available to users. If the option was assigned to an expense item previously, it will remain assigned. To make an option available again, click Edit next to the option name and then click Enable. Archiving a group will remove it from your Expend dashboard completely. On the tracking page, find the group you want to archive. The group will no longer be available on your dashboard, nor to users. However, any options from the group that were assigned to expense items previously will remain assigned. Users will not be able to change this. If you archive a group that you imported from your accounting platform, you will be able to import it again.